Watch Band For Apple Watch,TFSeven Classic Handcraft Leather Business Replacement iWatch Strap for iWatch Apple Watch Nike+ Sport Edition Series 1 Series 2 Series 3, S/M Size (Black, 38mm) by TFSeven® at DJ Luu. Hurry! Limited time offer. Offer valid only while supplies last. Features - Compatible with Apple Watch all models (Apple Watch Series 3, Series 2, Series 1). - Top handcraft leather material, classic design. - Top handcraft leather material, classic design. Best partner for your precious watch. The product is only the watch band, No Apple Watch Included. 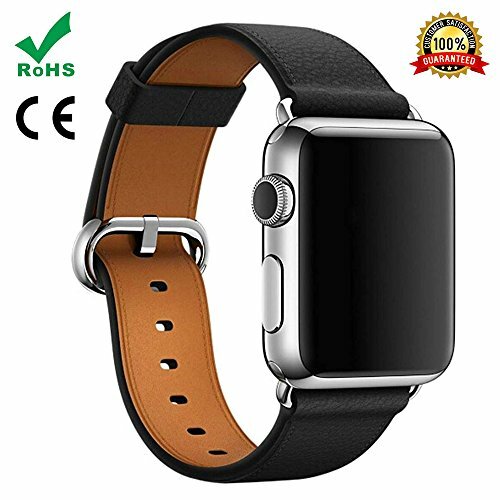 Q: Does the leather band fit Apple Watch Series 3? Does the band work for me, with a 6.5 inch wrist size? Yes, our 38mm band suitable for wrist 5.4"-7.5"(137mm-190mm), and 42mm band for wrist 6.0"-8.5"(152mm-216mm). A: All of our items have passes rigorous quality control procedures. If you get a defective one, we will solve your problem immediately and put smile back on your face. 【High Quality Material】The band is consists of 2 pieces of man made leather which are made by a number of processes. Hence it is more wear and corrosion-resisting. Compared to rubber band, this stainless steel watch band has better breathability and prevents you from allergy.Comparable to original Apple Sport Band. 【Business Style】Designed classic style, which can be firmly wore and easy to take off. Perfectly fit for Apple Watch series 3 2 1,Apple Watch Nike+ & Sport & Edition.Personalize your apple watch to fit your mood and outfit in daily life. 【Easy to Install】Stylish and attractive colors make your watch look fantastic and luxurious. Elevates your style for every occasion Easy and direct installation and one button removal. 【Buy it Risk-Free】We are happy to send out a new one for you if your band has any quality issues, please kindly let us know. So please feel easy to order it.If you have any problem, please contact us without hesitation. If you have any questions about this product by TFSeven®, contact us by completing and submitting the form below. If you are looking for a specif part number, please include it with your message.